these are but a few of the words our devoted customers have used to describe our food. Everything we offer is the freshest and most delicious possible. From sweets to savory, each item is painstakingly prepared with the utmost in care to insure your complete satisfaction. Our staff of skilled professionals work together to create some of the most incredible treats you have ever tasted. We invite you to try our products and judge for yourself. We promise, you will not be disappointed. A beautiful Al Fresco lunch in Santa Barbara. 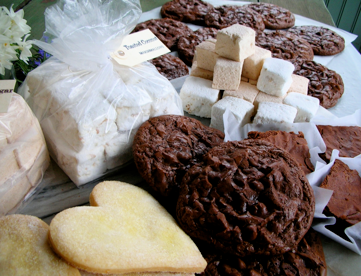 Just a sample of our mail order dessert offerings. Perfect lemon petit fours served at tea.